Open any guide to Cologne, and no doubt its Dom will be the first thing it mentions. “No other Cathedral is so perfectly conceived, so uniformly and uncompromisingly executed in all its parts,” UNESCO writes. 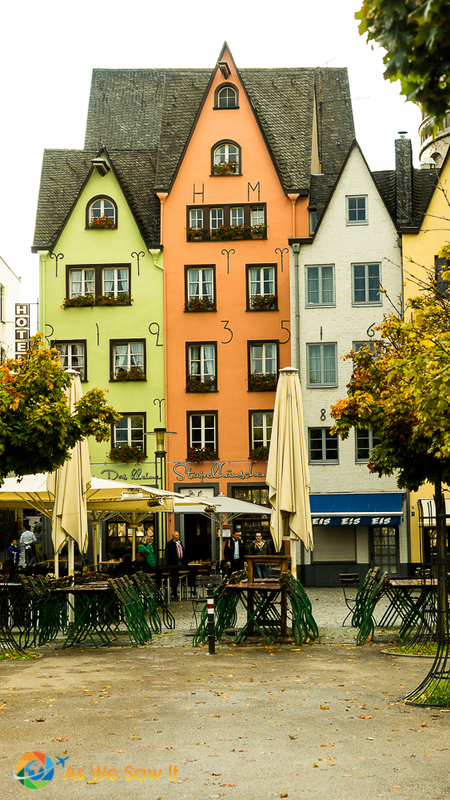 Thus did this world heritage site become the highlight of most Cologne tours. But I'm not sure it was the highlight of our day in Cologne. 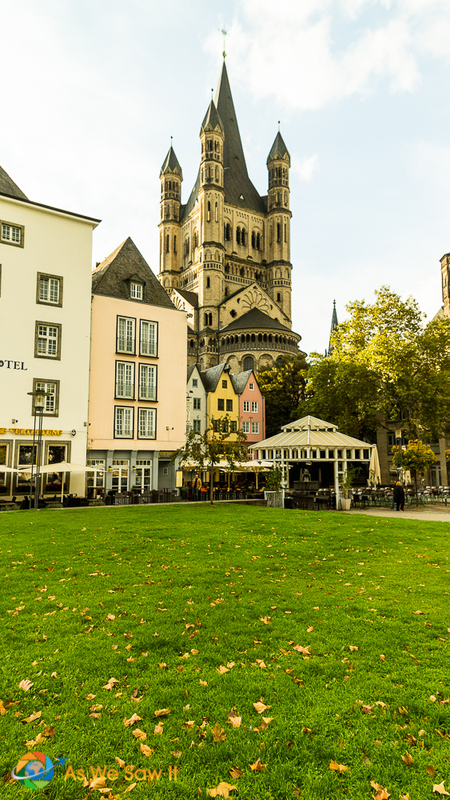 Before I give you a list of some of the things to see in Cologne, I should mention that we've spent visited Cologne three times: twice while on a river cruise and once while visiting friends who live there. So I'm going to list a few of the top highlights for the morning, plus with a few other ideas for how to spend some of your afternoon. You might not be able to do them all in one day, but this way, you can tailor your day as you wish. I'm also going to include information about Viking River Cruises' Cologne itinerary, for those of you who are arriving that way. 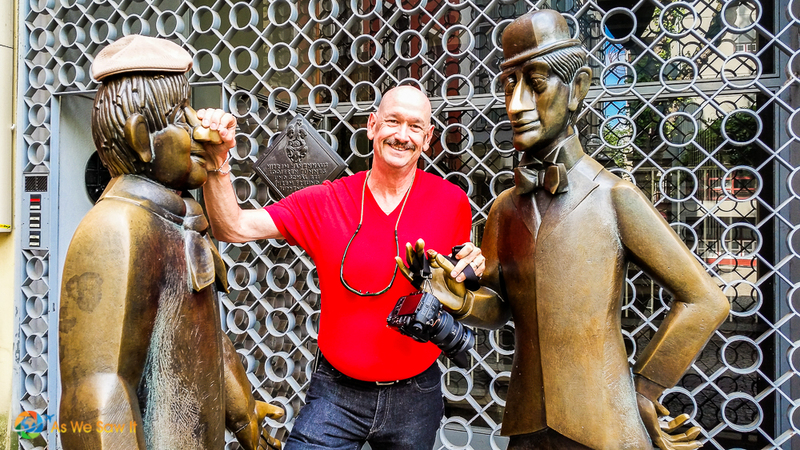 This is because I've written a series of articles covering stops on our Budapest-to-Amsterdam cruise and our Basel-to-Amsterdam Rhine Cruise, and this article is a part of both. You can skim past those parts if river cruising doesn't apply. No hard feelings. If you're in town on a Rhine Cruise, Cologne has docks along the river, right in the middle of town. That's so convenient for cruisers. However, when a lot of cruise ships are in port, you might have to dock a little bit out of town. We've experienced both. Out-of-town dockings mean you'll have to take a 10-minute bus ride into town. Although it isn't very far, it's a long walk. For passenger convenience, many ships have buses that will shuttle between ship and city center all day. On our cruise, the last bus departed Cologne and returned to the ship at 5:30 PM. River cruises usually offer a free group tour as part of their itinerary. Keep in mind that guides need to keep everyone together, so that will slow down your trip. They also try to show a variety of sights, to appeal to different interests. This may or may not appeal to you. 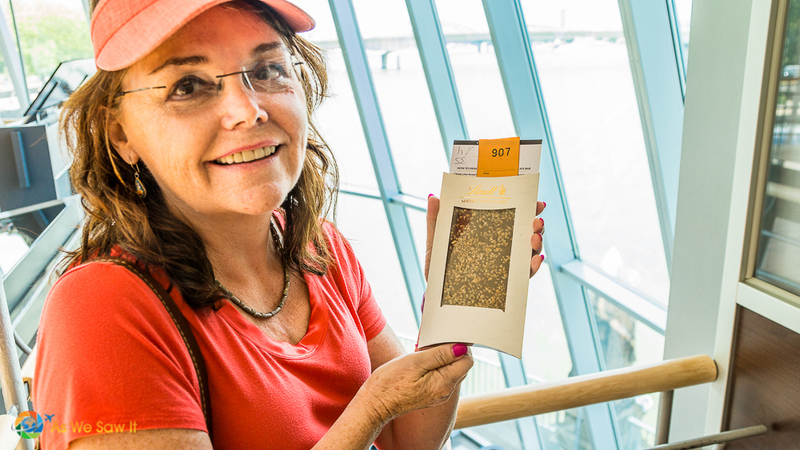 Or, you can do both: First, use the guidebook beforehand to research what you'll want to see, and then hire a private guide to take you to those spots as well as answer any questions you might have. The Tourist Information Office is across the plaza from the Cathedral. Besides offering the usual tourist maps, advice and lodging assistance they also have a nice gift shop and restaurant. They also have working plumbing. Hurrah! Tip: The Tourist Information Office has clean public toilet facilities. As is common in Europe, you are expected to tip the washroom attendant. The customary amount is 50 cents (half a euro). Handicap facilities are available. Let’s start with the city’s crown jewel, Cologne Cathedral, which has exquisite stained glass windows. It may not be the only cathedral that’s taken over six centuries to build (1248 – 1880), but it is unique in one respect. Even after six centuries, the plans never changed; the builders always remained loyal to the original design. Kölner Dom is the largest Gothic cathedral in northern Europe and its two massive towers dominate the city’s skyline. That being the case, it might seem a miracle that the cathedral didn't get blasted to smithereens during World War II. Actually, it’s precisely because it was so easy to spot that it was spared: Both sides preserved it because it made a good landmark for pilots on bombing missions! Cologne Cathedral was damaged during World War II and the stone is still white on the repaired sections. 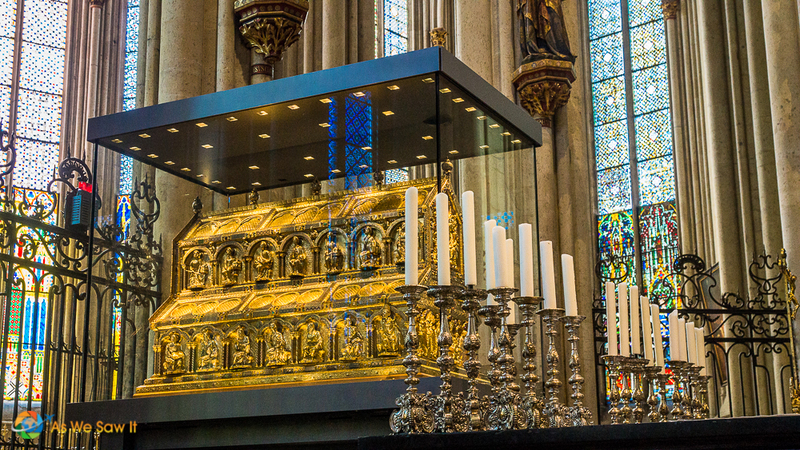 In the 1100s, the Holy Roman Emperor awarded Cologne Dom a reliquary said to contain the remains of the Three Wise Men. 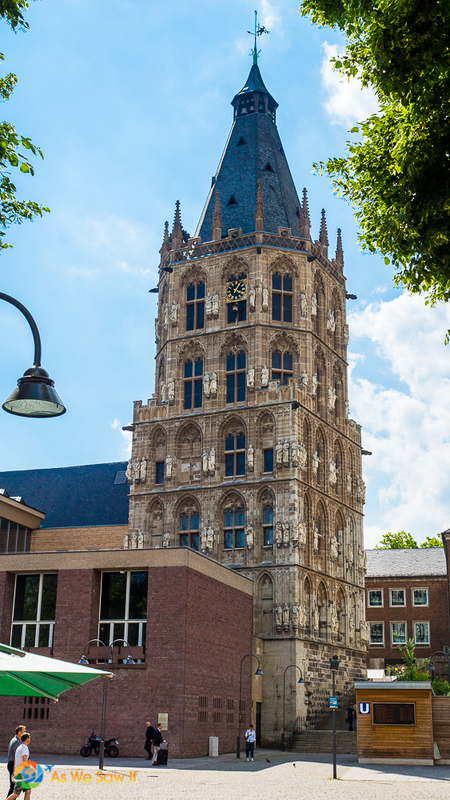 The coveted treasure made the dom one of Europe’s most important places of pilgrimage (a.k.a. donations) during the Middle Ages. The reliquary is still on display in the sanctuary. The cathedral is open from 6 am – 9 pm daily. If you would like to explore further and your knees can handle it, you can pay €3 to climb the 509 steps to the top, where you will get a fabulous panorama views of the city. You can also tour the treasury (€4), or simply visit the chapel (free). Cologne began as a Roman settlement called of Colonia Claudia Ara Agrippinensium. 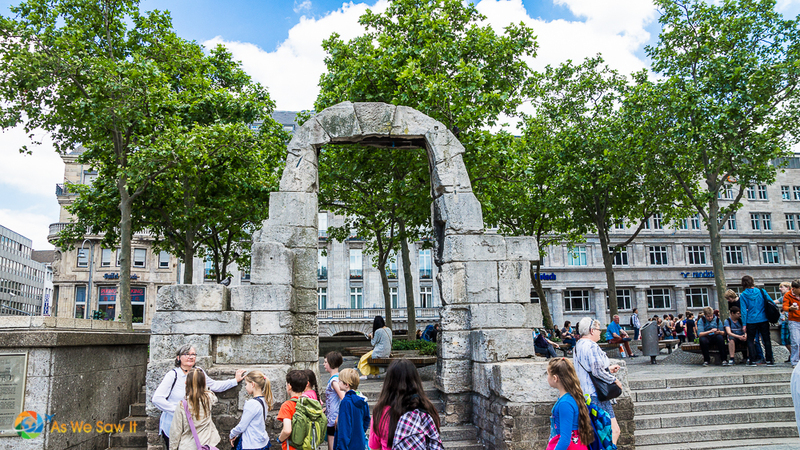 You will come across fragments of Roman ruins in some parts of the city, and the Roman gate that stands in the Cathedral’s square is one of them. It’s in good shape for being 2000 years old. Also in the cathedral's main square is the Romano-Germanic Museum. This museum holds many of the ancient artifacts they have found over the years, most notably an intricate mosaic floor that had once been part of a Roman villa's main hall. The villa was discovered during World War II while they were constructing of an air-raid shelter. The mosaic could not be moved easily, so they left the floor where it was and designed the museum around the mosaic. We didn't visit, but other passengers told us that it was quite interesting. You can look through the windows from outside and see the mosaic on display. Apologies, though, for the photo quality; my cell phone refused to focus through the glass. Closed Mondays. Open Tuesday – Sunday 10 am – 5 pm. What to eat. 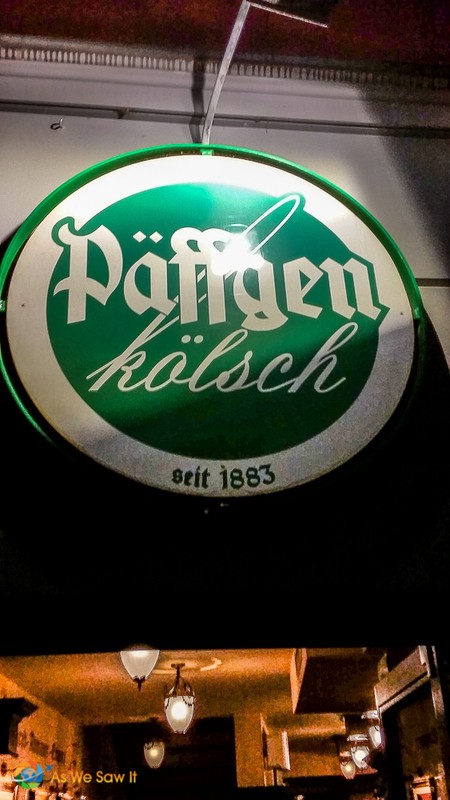 Our Viking Daily had recommended that we try Cologne’s typical Halver Hahn. Oddly for a German city, the sandwich doesn’t contain a single pork product. Rather, it’s a buttered rye roll that has been halved and topped with Gouda cheese and mustard and comes with pickles and onions. Unfortunately for people like me, they aren’t gluten free so that wasn't an option. I'd still like to know how it tastes so if you have tried it, please share your thoughts. Whre we ate. I have a “thing” for visiting Hard Rock Cafés in cities all over the world, just to say I’ve been there. Silly, I know, but there you have it. 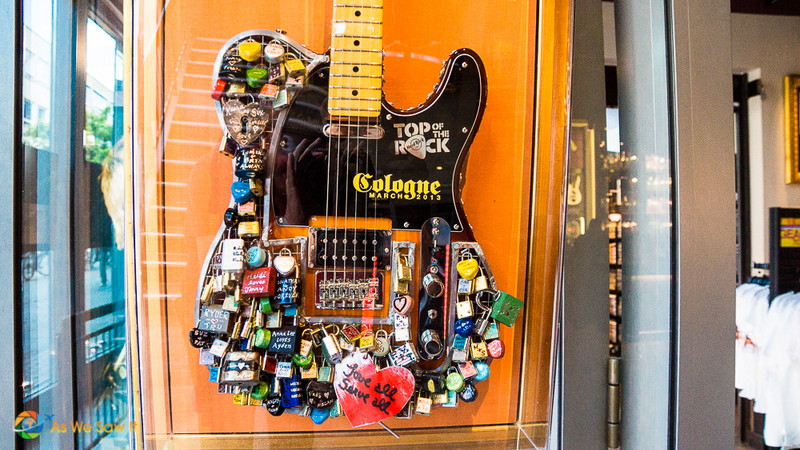 And there, too, was Cologne’s Hard Rock. Dan didn’t mind, as long as they served Kölsch, a brew unique to Cologne. He has a “thing” for that beer. So we’re even. We each had one of the restaurant’s specialty burgers and saved just enough room for our next destination. Moreso than the cathedral; this was the highlight of our day. Cologne is the home of the Chocolate Museum, situated right on the banks of the Rhine River, only a few minutes’ walk from the cathedral. Inside is a fabulous gift shop of chocolate deliciousness, a chocolate cafe overlooking the water, and a museum of the history of cocoa around the world, chocolate uses, and more. The displays teach you all about the history of cocoa and the process of turning this bitter bean into lovely bars of luxurious chocolate. That said, the most popular part of the exhibit was the 10-foot high chocolate fountain – complete with samples. 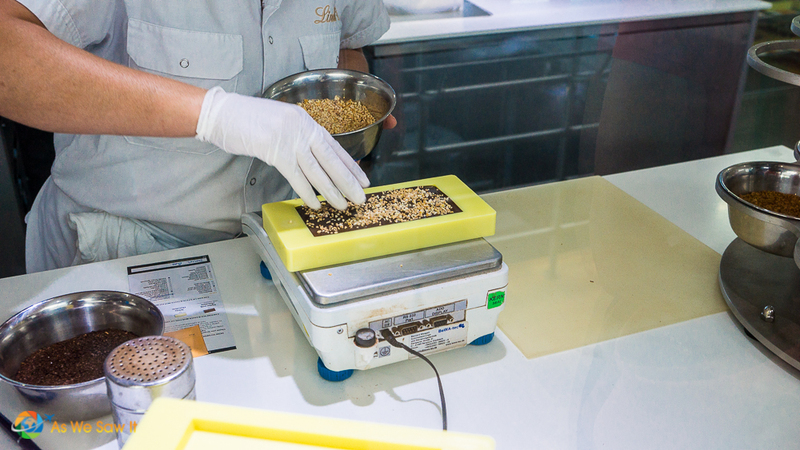 We watched the chocolate-making process and took advantage of a unique opportunity to order our own custom chocolate bar. Yum! On our way out, we filled a sack full of colorful foil-wrapped [easyazon_link identifier=”B00QIRM3CW” locale=”US” tag=”awsi09-20″]Lindt chocolate truffles[/easyazon_link] in the gift shop. At least two of every available flavor ended up in our bag, so we wouldn't need to share! Open daily, 10 am – 6 pm. Cost: €11,50 for adults; €3,50 extra for guided tour. Tours are also available for visually handicapped and persons with disabilities. See website for details. 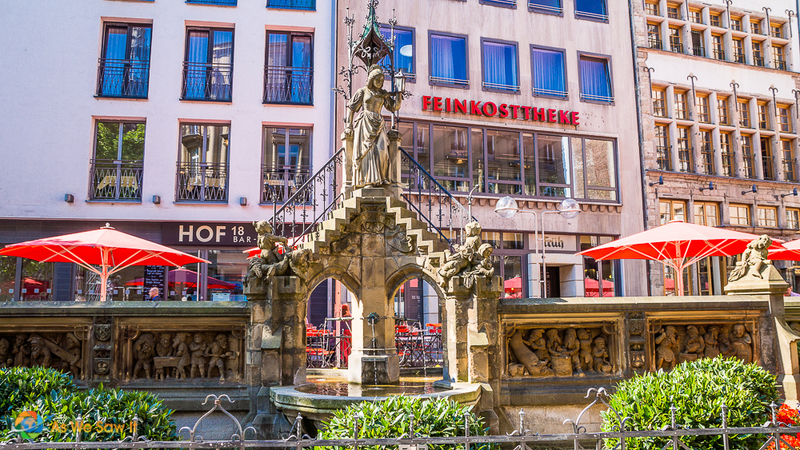 Cologne is full of Roman ruins, Romanesque churches, a Renaissance city hall, and more than its share of breweries, pubs and restaurants. 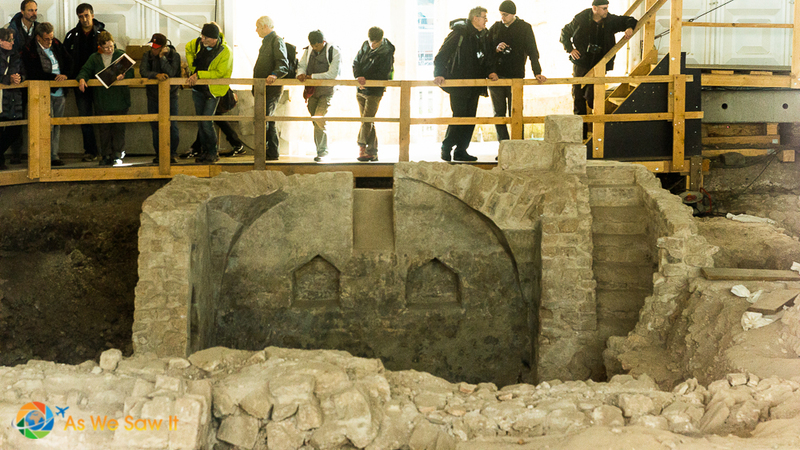 It also has an archaeological zone that includes the 2000-year-old Roman praetorium and the more recent remnants of an ancient Jewish mikveh. We spent the balance of our afternoon looking at the excavations, wandering through its twisting streets and alleyways admiring the traditional architecture and fountains, and menu reading. 4711 House of Fragrances has a flagship store that is open Monday – Friday 9.30 am – 6.30 pm and Saturday 9.30 am – 6 pm. Guided historical tours are also available daily at 1 pm, €7. Here are a few highlights from Cologne photo albums. Tünnes and Schäl are two figures from Hänneschen-Theater, the puppet theater of Cologne. Tünnes is wearing Dan's cap and Schäl is holding Dan's camera. You might want to stay here if you're a beer fan. 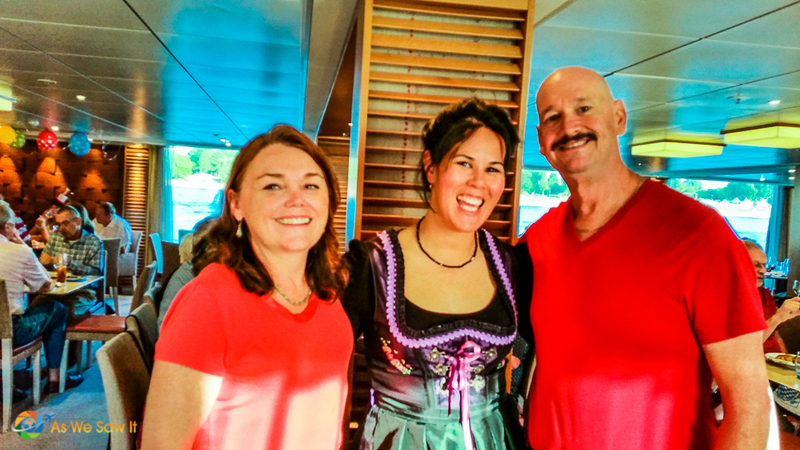 We returned to the ship just before the 5:00 presentation on Germany Today, given by a guest lecturer. It was quite interesting and especially nice to relax with a cocktail and rest our feet. Following that, Dewi gave the daily briefing, which I didn’t like because it included disembarkation details. Nooo! I have had far too much fun on this cruise to want it to end. Our Program Director Dewi is Dutch-Indonesian and her name is pronounced Davey. Viking went all out with tonight’s dinner: A Taste of Germany. 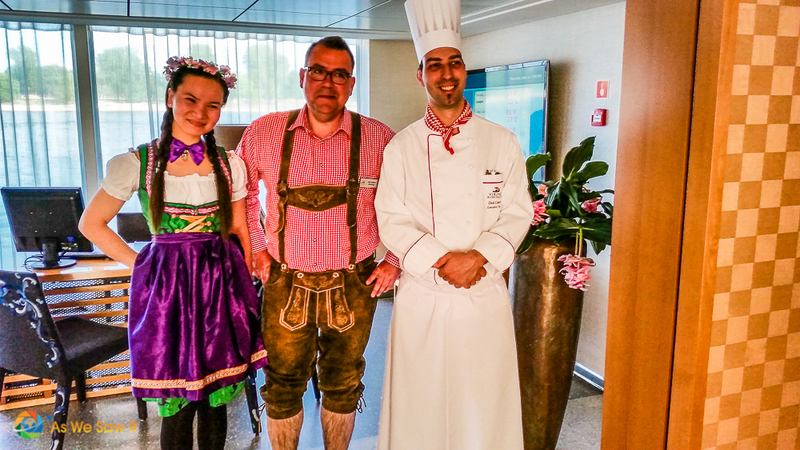 Staff dressed up in traditional costumes and a musical duet paraded through the dining room serenading us throughout the meal. The meal itself was served buffet-style and there were choices galore. Between the pork and wheat, I would have preferred to order one of Viking's “always available” meals off the menu … but that wasn't possible tonight because the galley had been prepped for visitors and staff were busy in the dining room. Chef Zsolt took me around personally and made sure that I didn’t take anything I shouldn’t eat. 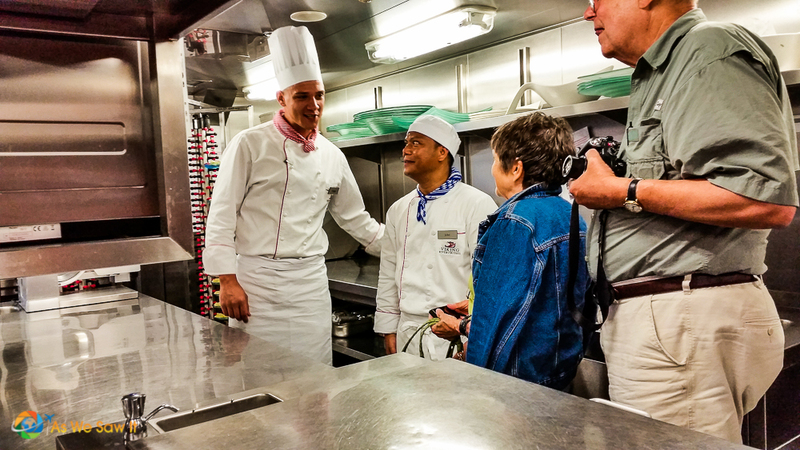 Guests were welcome to visit the galley during the dinner, so Dan and I went to see where all the food is prepared. 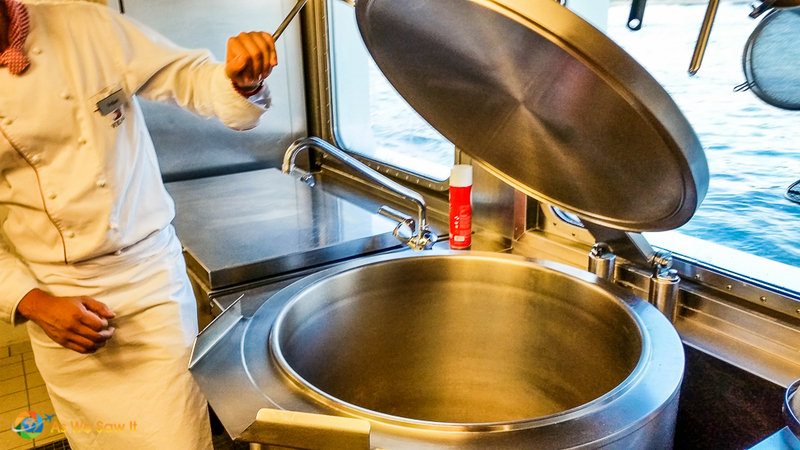 All was so very high tech, efficient and easy to clean that I found myself wishing it were our kitchen…. We were surprised at how much natural light they get. Even the staff get windows and views. They were waiting for the right moment to present this. Prost! is the German way to say cheers!, and we said it a lot in Cologne. Cologne is known for its brauhaus (pub) culture, thanks to its unique beer, known as Kölsch. Kölsch is one of the palest German beers made. 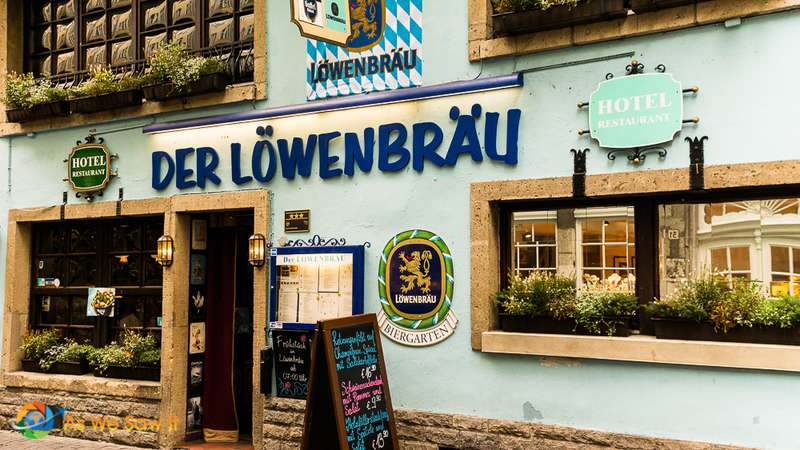 It has been called Germany's answer to the British pale ale (though it's brewed from mainly Pilsener malt), and more than 20 breweries in the city make it. Call it a German pub crawl, if you will. 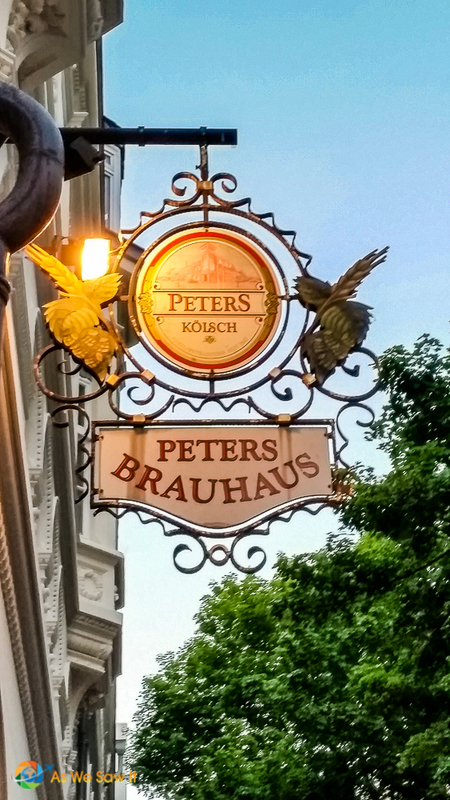 Viking offered a Brauhaus culture excursion so guests could experience Cologne’s beer culture first hand. We had taken this optional excursion on our previous cruise and enjoyed it so much we signed up for it again. It was so worth the €29. 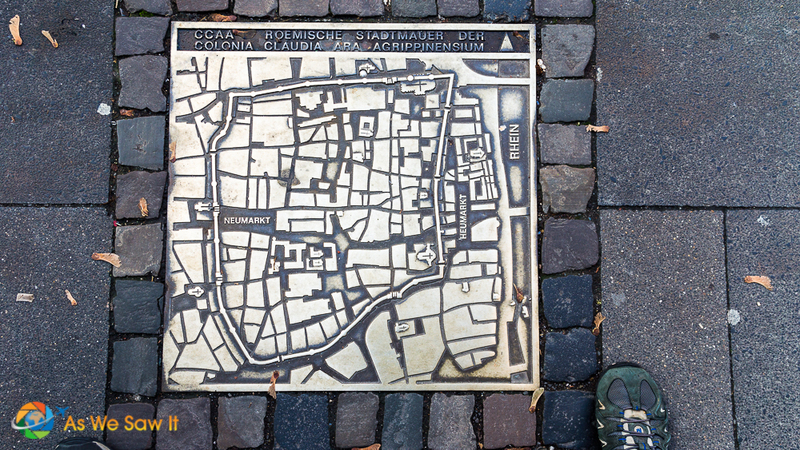 Sure, you can pub crawl on your own, but there's a lot to be said about having a local provide insight into Cologne’s history and culture. Even some who were not beer fans joined in so they could experience Cologne's nightlife. 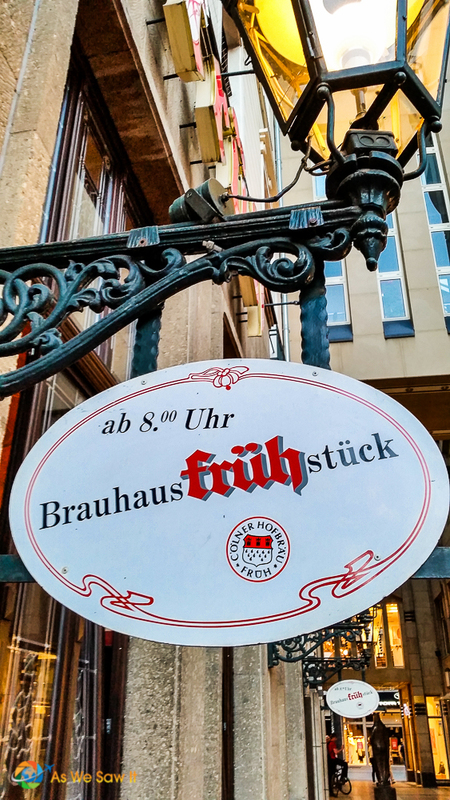 Our tour guide began by telling our group that each breuhaus (beer hall) carries kolsch from one brewery exclusively, so we would visit three beer halls and try three varieties of kolsch. We might be able to try a fourth, he promised, if we didn't linger in any of the first three for too long. In Cologne, it's hard to get drunk quickly, because Kolsch is served in .2 liter glasses. Because kolsch is top-fermented, it can lose its fizz quickly. The smaller serving size help the bubbles remain until you've finished your glass. Waiters carry trays of kolsch between the tables, keeping their eyes open for empty glasses. When they see one, they will quickly replace it with a new, full glass. Our guide told us that in Kölsch culture, they will keep the beers coming until you place a coaster over your glass. That is the signal that you don't want a refill. We all had so much fun that we didn’t want the evening to end and begged Dewi, who had accompanied us on the tour, to let us visit just one more brauhaus. Pretty please? All I can say is that we were the last group to return to the ship, laughing and chatting all the way like old friends. I think the captain had been waiting for us because we left Cologne only a few moments after the gangplank was raised. Cologne has many useful trip planning resources on their official website. There is a tourist information office across the plaza in front of Cologne Dom. Lodging– For sleeping options, HotelsCombined compiles deals from all over the web. Transportation– This website shows how to get anywhere by plane, train, bus, ferry and car. 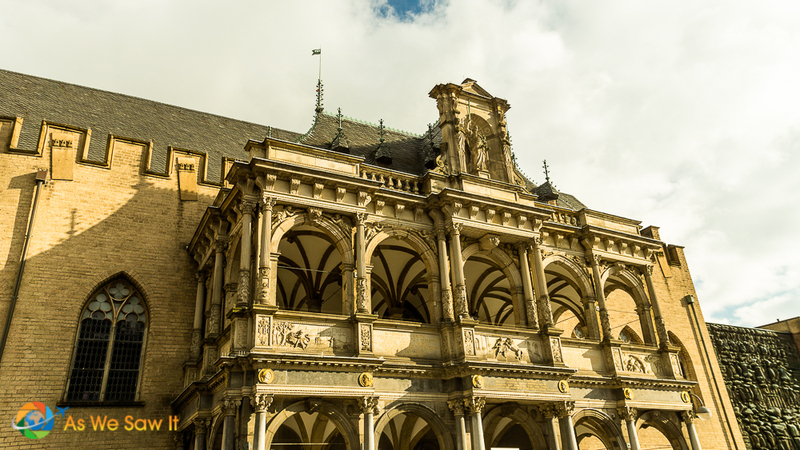 Get Your Guide offers affordable, custom tours to and around Cologne. Click here to see the list. 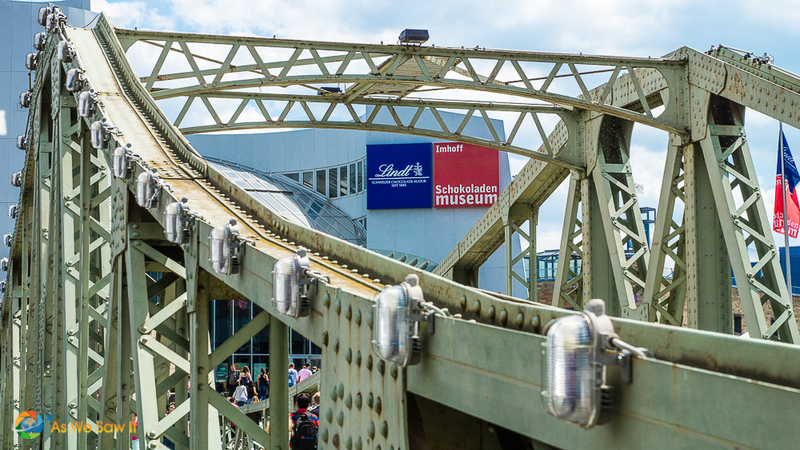 For more sightseeing, see our photo album from Cologne. Google Maps offers an aerial view of the area around Cologne Cathedral. Zoom, scroll around and explore! Beautiful collection of photos! I have always just seen the stunning cathedral when people post things about Cologne. I’m glad there are many other attractions. You can certainly cover a lot in a day. I’m salivating at the thought of the Chocolate Museum. Eau de Cologne originated here so there’s a fragrance museum as well. We thought about seeing that instead, but our taste buds won out.